The Spanish football league La Liga announced enrolment of several Saudi top players in a move to sharpen the Saudi national team for the FIFA World Cup taking place in Russia this year. Six clubs in La Liga have announced agreement with General Sports Authority (GSA) and the Kingdom’s Football Association (SAFF) to enroll nine top Saudi players, including two academy players in a deal expected to boost football in the kingdom and prepare the national team to perform better during Russian tournament. 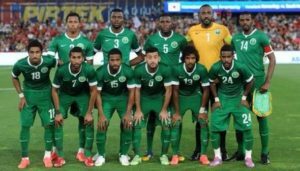 The Saudi national football team is largely made up of local talents, except Mukhtar Ali who plays for the Dutch top flight side of Vitesse Arnhem. The National team qualified last year for the Russian tournament for the first time since 2006. Saudi Arabia will kick off the competition with the host country on June 14. Written by: KanelkaTagba on January 23, 2018. Posted by KanelkaTagba on Jan 23 2018. Filed under Gulf News, Headlines. You can follow any responses to this entry through the RSS 2.0. Both comments and pings are currently closed.